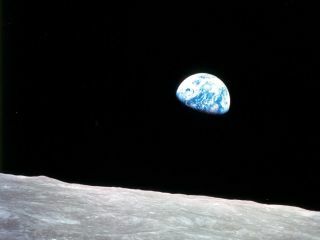 The Apollo 8 astronauts broadcast never-before views of the Earth and moon on December 24, 1968. Apollo 8 was the second crewed mission of the Apollo program and the first mission to bring humans to the moon. The six-day mission lifted off on Dec. 21, 1968, with its crew of Frank Borman, Jim Lovell and Bill Anders. The flight included a day orbiting the moon, during which the astronauts took the "Earthrise" picture — one of the most iconic photographs ever taken of our planet. The photo has also been credited as a major impetus for the environmental movement. This historic mission happened because of a last-minute decision from NASA management. Initially, the agency planned to test the lunar and command module components of the Apollo spacecraft first before striking out for the moon. At the time, the United States and Russia were engaged in a "space race," endeavoring to demonstrate their technological prestige in space exploration. And NASA — while keeping crew safety in mind — wanted to take the necessary steps to bring Americans to the moon as soon as possible. But sending Apollo 8 to lunar orbit after only one previous Apollo mission, which had remained in Earth orbit, was a difficult decision. "NASA officials realized that this was risky, since Apollo 7 had not yet qualified the spacecraft when their tentative decision was made," a NASA historical document reported. The decision was further complicated by Apollo 8's need for a more powerful rocket, called the Saturn V, which had never been tested on a crewed launch. But after months of discussion, NASA decided to move forward with an Apollo 8 moon mission on Nov. 10, about a month before the launch. Spacecraft commander Borman and crewmember Lovell were also crewmates on the Gemini 7 mission, which aimed to test endurance. They spent nearly 14 days living together in a small spacecraft. Borman had also distinguished himself by serving on a review board investigating the Apollo 1 fatal fire in 1967. The mission's third crewmember, Anders, was a former fighter pilot in the U.S. Air Force. He hadn’t flown in space before but had served as a backup crewmember for Gemini 11. The night before launch, aviation pioneer Charles Lindbergh paid a visit to the Apollo 8 crew. Lindbergh, whose nickname was "Lucky Lindy," was the first person to fly solo over the Atlantic Ocean, which he'd done 41 years before. He asked how much fuel they would need to get into space, according to Robert Zimmerman's account in his book "Genesis: The Story of Apollo 8" (Dell, 1999). When Lindbergh heard that the rocket would consume 20 tons of fuel a second, he smiled and said, "In the first second of your flight tomorrow, you'll burn 10 times more fuel than I did all the way to Paris." Just 18 hours after launch, Apollo 8 experienced a major problem: Borman fell ill and struggled through vomiting and diarrhea. The commander felt better after getting some sleep, but as a precaution, the other crewmembers radioed to Earth on a private channel and explained Borman's predicament. NASA performed a private medical consultation for Borman. When hearing that Borman's health had improved, NASA cautiously gave the approval to continue with the mission. Placing the Apollo spacecraft in lunar orbit was not easy. Compounding the difficulty, the engine firing, which would put the spacecraft in the right spot, had to happen while the spacecraft was out of contact with Earth, on the far side of the moon. But the crew remained focused, and Apollo 8 made it into lunar orbit right on schedule. On Christmas Eve, the crew had the chance to share their impressions with others via a public broadcast. Borman called the moon a "vast, lonely, forbidding type of existence," while Lovell paid tribute to the Earth's "grand ovation to the vastness of space." The crew also read a passage from Genesis, the first book of the Bible. All that remained was the return trip home. Mission controllers waited anxiously Christmas morning as the crew turned their engine on again, on the far side of the moon. As they re-emerged, Lovell called out, "Please be informed, there is a Santa Claus," signaling that the ship was headed back to Earth. The crew landed successfully on Dec. 27. The Apollo 8 spacecraft is on display at the Chicago Museum of Science and Industry. This craft showed that Apollo could safely bring humans to the moon; the next major task would be learning how to land on the lunar surface. After Apollo 8, the Apollo 10 mission brought the lunar lander to within 50,000 feet (15,200 meters) of the moon's surface, to simulate a landing. Then, in 1969, Apollo 11 safely landed the first people on the moon. NASA sent several other missions to the moon, with five landing successfully (Apollo 12, and Apollos 14 through 17). In the decades following the Apollo missions, NASA turned its attention to Earth orbit, with efforts including the space shuttle program and the International Space Station. But the agency never discounted the possibility of sending humans to the moon and even Mars. In late 2017, by a directive from President Trump's administration, NASA began prioritizing completing a moon mission before sending people to Mars. The agency is designing a lunar space station called the Deep Space Gateway and testing out a spacecraft called Orion that is expected to bring astronauts beyond low Earth orbit.